Independence Day (aka the Fourth of July) is celebrated across the country in many ways. In my town of Allendale, MI (pop. 20,000+), there is a traditional parade. To summarize the experience: families lined the sidewalks with lawn chairs and picnic blankets. They wore red-white-blue clothing and even fancy hats, glasses, and buttons. On the parade route, there were musicians, service vehicles, politicians, military veterans, and lots of tractors. This may be because tractors are good at pulling floats. In the case of Allendale, it's because of agriculture. Ottawa County is Michigan's second biggest agricultural producer, so the folks around these parts have tractors: new ones, old ones, and antique ones. Here are the morning's photos in a slideshow, along with some brief commentary. I hope this gives a glimpse of small-town American culture for my international readers. The entrance to Grand Valley State University, which hosts the annual Allendale Independence Day parade. With lights flashing, this sheriff's vehicle leads the parade. The high school marching band was one of several music groups to entertain the parade watchers. This mom and daughter were glad to share their Independence Day spirit on camera. The headgear with a pair of spring-mounted decorations are called deeply-bobbers. Tractors, old and new, drove the 45-minute-long parade route. 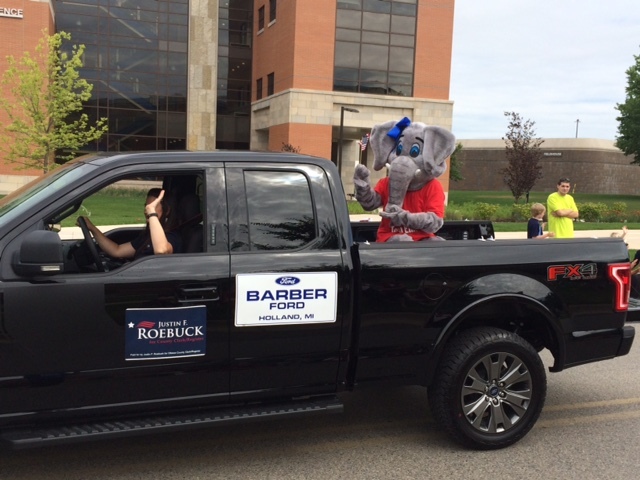 Some political candidates drove trucks. The elephant is a symbol for the Republican Party. 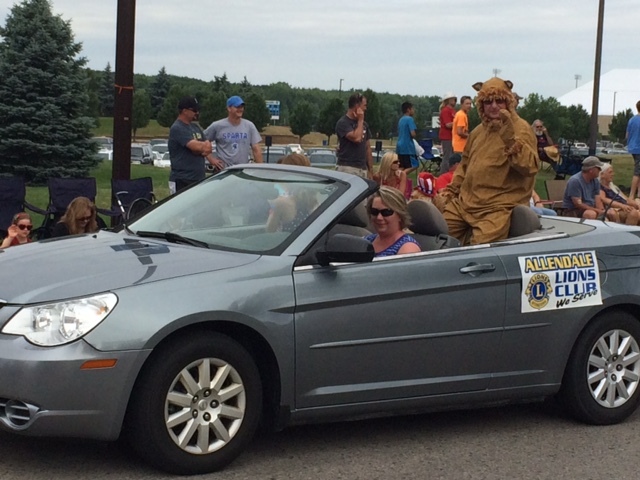 The Lions Club has chapters around the world. Among other efforts, they promote eye health. Red, white, & blue spectator enjoys a snack. 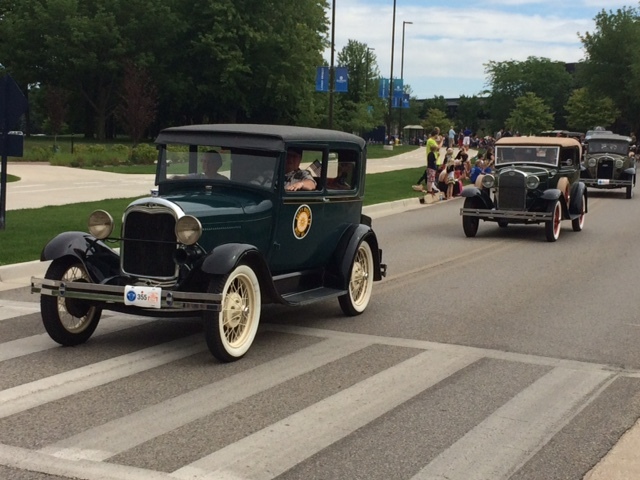 Antique cars are also popular in American parades. The Grand Marshall of the day's parade. A really big cow! Oh, yes, and a tractor! Note volunteers handing out flyers. The prominent colors of the day: red, white, and blue! The area fire departments joined the parade. In addition, there were law enforcement vehicles and emergency medical services (EMS) vehicles. Many floats had volunteers with buckets of candy to throw to the spectators. The local Veterans of Foreign Wars (VFW) entered this vehicle in the parade. Wheelchair user Jim Troost (see below) preceded this truck telling spectators that this post was led by their first-ever female president (standing, in white). Jim Troost took this selfie to show his Donald Trump friends that he was able to have a conversation with a Democrat. Troost is a member of the Grandville, MI, Sons of the American Legion (SAL). His father was a military veteran. Military veterans both marched and rode in vehicles, receiving applause for their service from spectators. The local library's reading bus was a colorful addition to the day's event. 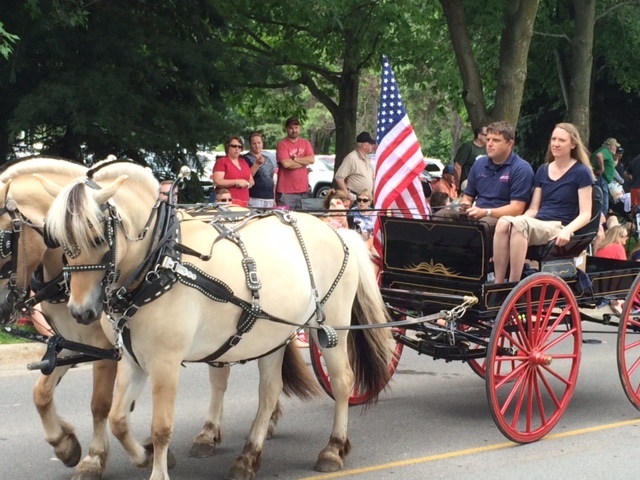 Large or small, all parade entrants proudly featured the national colors. The Girl Scouts had a float. The local Cub Scouts were entered as well. Spectators stood, sat on blankets, relaxed in lawn chairs, or slept in strollers along the parade route. Every parade needs at least one clown! 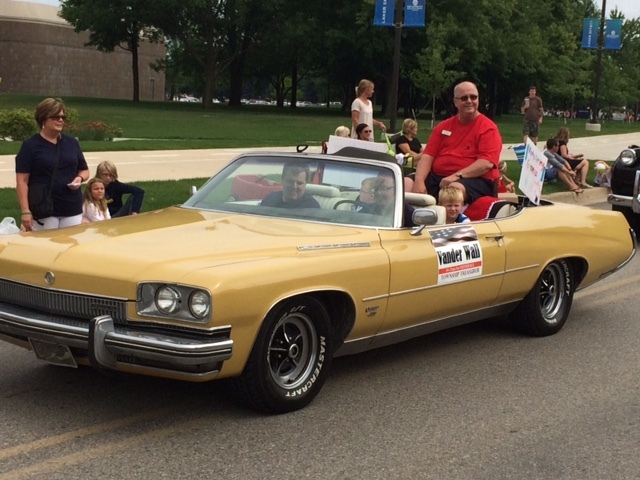 Political candidates sat on floats, marched on foot, waved from trucks, or rode in cars--in this case, an old Buick convertible. My friend, Ray Nadda, owns a pet-grooming salon as his day job. He is entered in the August Republican primary election for local office.